It’s important to show that you’ve made an effort when you entertain as it makes people feel special and we all want to get a pat on the back when we’ve cooked a meal for our friends and family, so learn a few tricks that make your guests feel welcome and you’ll be fighting off the compliments! The first thing you need to think about is what your guests will see when they arrive. You don’t have to go crazy and re-tarmac the drive, but at least have a clean and tidy entrance. Go outside and open your front door to see the start of the night through the eyes of your guests – are there loads of dirty wellies or piles of recycling as you come in? Make it clean and tidy, perhaps with a place cleared to hang coats. At least spray a little polish around if you haven’t got time for a full clean! As your guests come into the house, think about the sights, smells and sounds that greet them. If it’s Christmas, have some festive music playing, or if you are hosting a summer party, you could play some upbeat jazz or classical music. You don’t want to be rushing upstairs to get dressed out of your cooking clothes and make them pour their own drink – the night will not start with an impressive air! Give yourself time to get ready before they arrive, after you’ve prepared the meal and tidied the washing up away. Presentation of yourself is just as important as the presentation of the food! Offer your guests a welcome drink as soon as they arrive. If you can stretch to it, a glass of champagne is the perfect start to any party, but cava, prosecco or a cocktail is also ideal. Have a few tasty canapés for passing around – simple spiced nuts or posh crisps are fine, although something with smoked salmon is always welcome. Canapés are a great way to impress without the stress – you can buy some really lovely ones from the supermarket that just need popping in the oven, or make plenty of one type and arrange them neatly on plain crockery. Presentation is key to impress – keep your food in straight lines, in towers or in serving bowls – no big dollops of mash with sausages sticking out please! Home made bread is also ideal for impressing your guests. If you have a bread maker, set it on the ‘dough’ setting and make individual dinner rolls. There is something special about freshly made bread and good salted butter that really adds those finishing touches to a meal. Even served with a simple soup, you have an impressive starter that needn’t cost much at all. 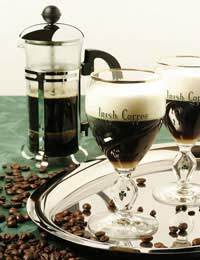 Irish coffees are perfect for finishing a meal with a flourish. Just make a cafetiere of good strong coffee and pour it into glasses with a measure of liqueur in the bottom. Stir in a teaspoon of sugar. Gently pour some lightly whipped double cream on the back of a spoon just touching the top of the coffee and it will float. Grate over a little chocolate and serve with brownies cut into neat squares. Perfect!